The medieval catalogue of the abbey of Lorsch now online! I discovered yesterday that there is a project to reconstitute online the scattered volumes of the library of the abbey of Lorsch in Germany, and that some of the books are now online. This includes the lengthy 9th century list of books then in the library. Lorsch was founded during the Dark Ages, as part of the revival of learning spearheaded by Charlemagne. A whole series of monasteries were founded, running eastwards, including Lorsch. The holdings of these libraries remained intact until the Renaissance. The 15th century manuscript hunter Poggio Bracciolini took advantage of his attendance at the Council of Constance (as a papal sidekick) to visit many of them, in search of the lost works of classical antiquity. Unfortunately they all suffered badly during the Thirty Years’ War, when the Swedish army campaigned in Southern Germany and destroyed all of them. Unique items went to line the leak boots of Swedish bombardiers. The loot of Lorsch was taken to the Palatinate, to Heidelberg, and the disposal of the books formed part of the settlement of the Thirty Years War. The Lorsch books mostly went to the Vatican, to form the “Palatinus Latinus” collection. Chronica Eusebii. Hieronymi & Bedae. In uno codice. Tripertita historia libri xii. Socratis, Zozomeni [i.e. Sozomen], Theodoriti. In uno codice. Gesta pontificorum romanorum. In uno codice. A little further down is the epitome of Pompeius Trogus in 44 books, in a single volume. Item alius lib. Tertulliani. (Likewise another book of Tertullian). This was almost certainly a copy of the two volume Corpus Cluniacensis of the works of Tertullian. Sadly it has not come down to us. The catalogue was printed long ago in G. Becker, Catalogi Bibliothecarum Antiqui, Bonnae 1885. Looking at these images makes me nostalgic for the 90s, when I had just started the Tertullian Project, and learned of the lost Tertullian of Lorsch. There was no Google Books then. So I travelled to Cambridge University Library to consult “Becker”. This was held in the awe-inspiring Rare Books Room, where you weren’t allowed to photocopy. Of course it was impossible to do more than skim the book, and I ended up buying a reprint online. (These days Becker is freely available for download at Archive.org, etc.) It is by my elbow as I write, a very early purchase in my work online. I read it, poring over the crabbed Latin, and reread it. First I looked for Tertullian’s; but gradually it became so much more. To read those library lists is to enter the literary history of the middle ages. The book is a massive compendium of lists of the works that really filled up monastic libraries. The bible at the front, then the fathers, then miscellania, then classical stuff at the back. The lists are full of works never read today, but everywhere in the middle ages. We read Tacitus and Suetonius; they read Dares Phrygius and Justinus. It is a vision of a different world. I never hoped that the manuscripts themselves would be online. But so they are. These are truly days of miracles and wonders. Mittelalterliche Bücherverzeichnisse aus Kloster Lorsch | Angelika Häse, 2002. 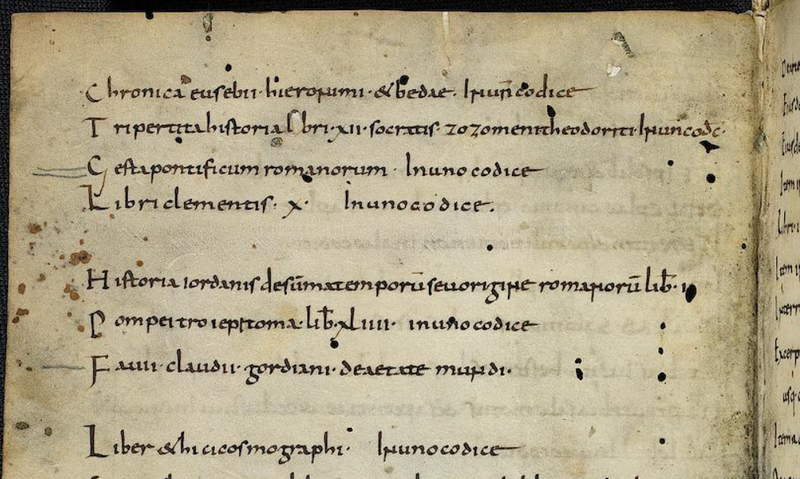 Pal.lat.234 caused a problem because according to the catalogue it should begin with the “Sentences of Sextus” – missing from the surviving MS. It should be there, and if we “restore” it our understanding of the purpose of the Collectio Palatina (with the writings of Marius Mercator) would change significantly.